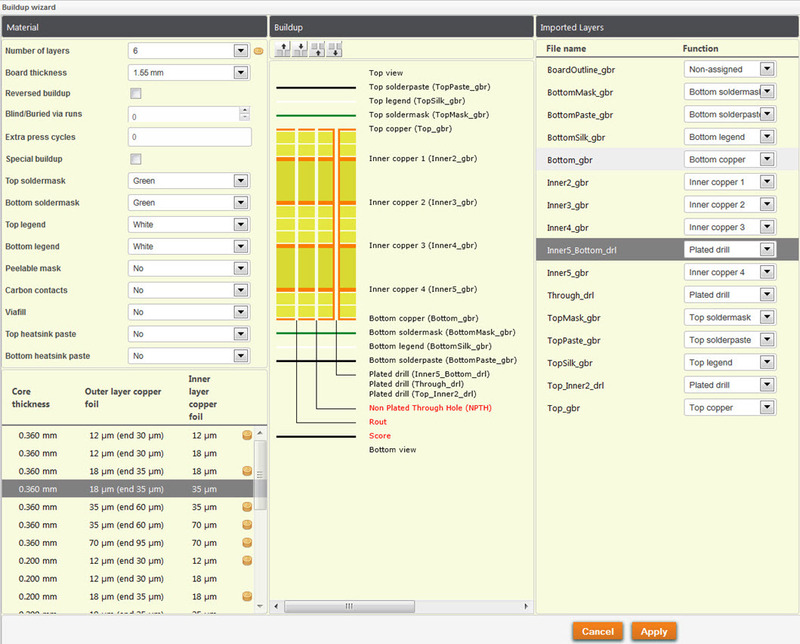 In November 2013 we launched the first version of our Buildup wizard and Layer editor. Meanwhile we have been looking at ways to make it easier and more convenient for users to order more complex boards online, to fine-tune orders and to check that data is complete, correct and manufacturable. 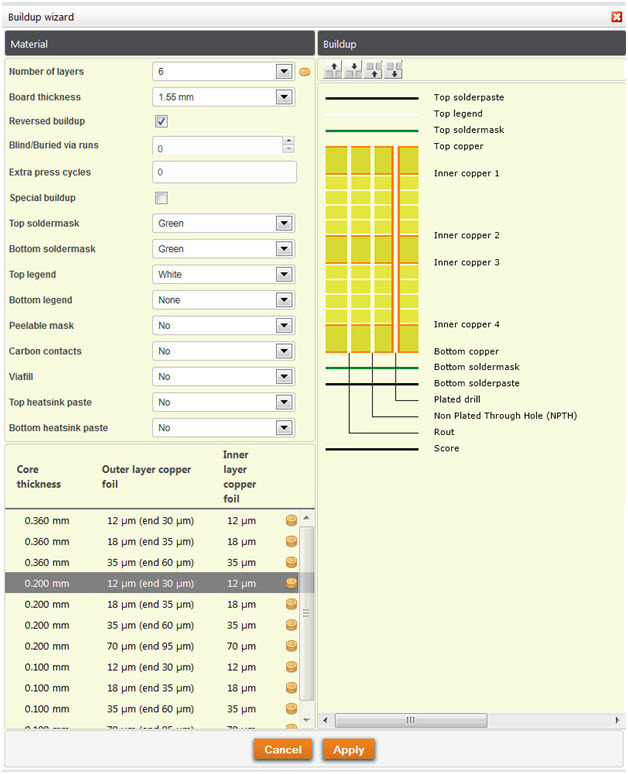 We have made a number of changes to the layout of the Price calculator and PCB Visualizer. One of these is to put the Buildup wizard and the Layer editor into a single screen and simplify the way they work. Got a build-related error message in PCB Visualizer, either after running the “Analyse your data” pricing option or on a job in your basket? The Layer editor allows you to assign manually files that for whatever reason PCB Visualizer has been unable to categorise. In the case here, PCB Configurator has given a warning message that there are extra drill layers which it cannot resolve. Open the Buildup wizard. 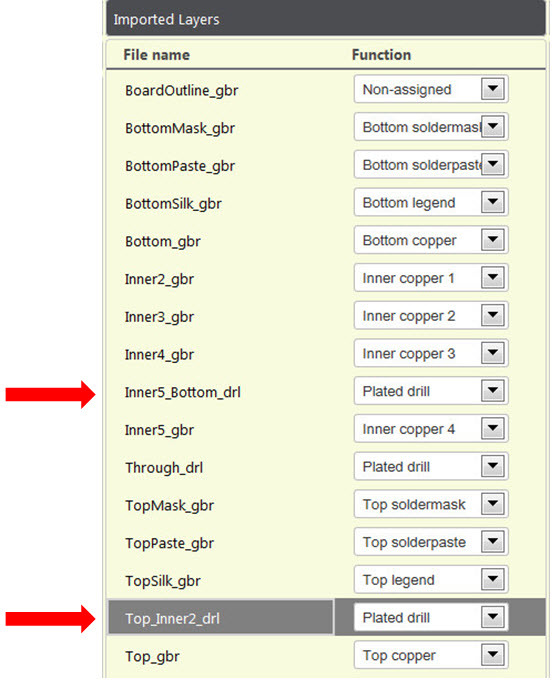 In the Imported Layers menu there are two blind via layers (Inner5_Bottom_drl and Top_Inner2_drl) which are designated as just Plated drill. To fix this, open the pull-down box. You will find a full list of layer-type options. Select layer-type “Extra blind/buried via runs”. 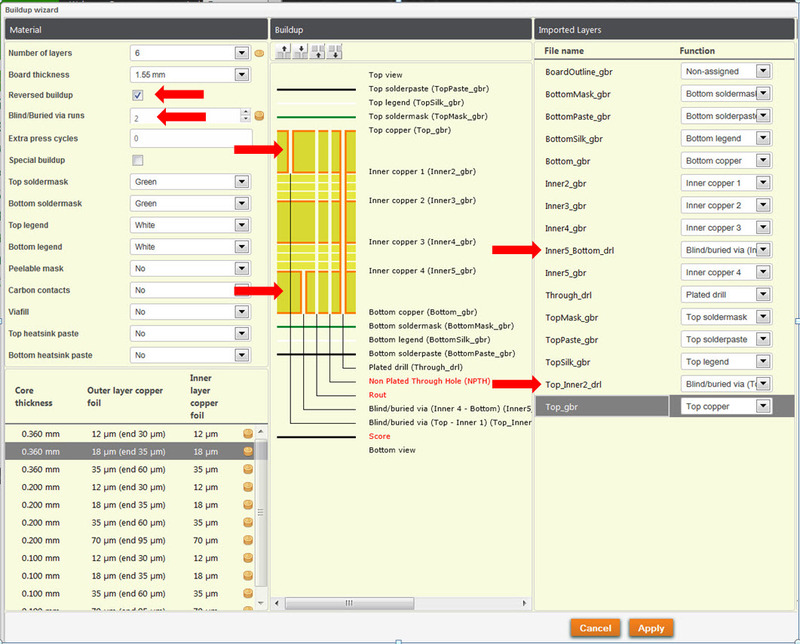 PCB Visualizer will ask which layers the vias connect, advise you to select a reversed layer build and automatically complete the build. Change core thickness and copper foil thickness using the box bottom left. Add blind or buried vias using the menu box “Blind/Buried via runs”. We are constantly striving to improve the comfort and convenience of our website. If you have any comments on this or any other part of our service please contact your usual sales channel, use our online chat or email us at euro@eurocircuits.com.